In a nutshell, sahti is a type of Finnish strong beer with a long history and traditional preparation methods. Its main ingredients are water, malted barley and other malts. The use of juniper is also notable: its twigs and berries can be used for flavour and aroma. Sometimes hops are used. The beverage is typically top-fermented using baker’s yeast, then cold-conditioned for at least one week, after which the serving of this fresh, living product can begin. 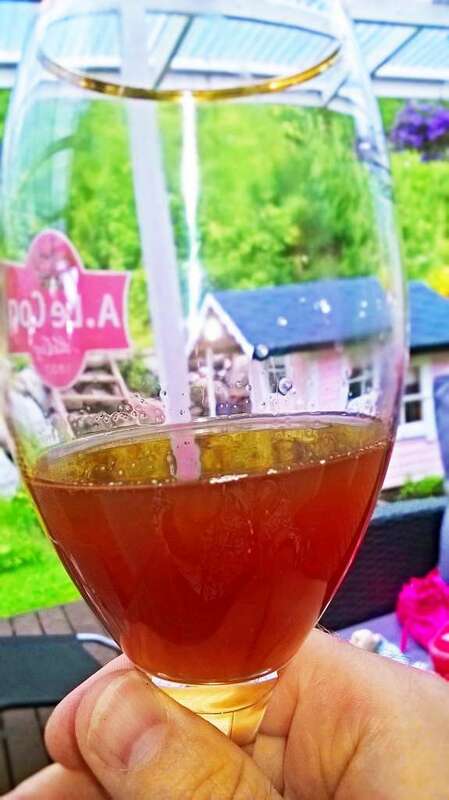 Sahti appears thick and cloudy and its colour varies from pale as a straw to dark as chocolate. The beer tastes slightly sweet and often has an aroma resembling banana, as in weizenbier. Due to the lack of additional carbonation, the mouthfeel is smooth, which makes sahti highly drinkable. At 6–12% ABV, this ethnobeer will put a smile on your face. Its specific characters are certified by the EU (the certification application is available online here). What is so great about sahti? As a fresh, unfiltered and unpasteurised product, sahti continues to evolve in the container like a cask ale, but its preparation process is unhurried and simple. The mash is typically a long step mash. Boiling the wort is rare, and many sahti makers prefer using the traditional wooden sahti brewing equipment. A wooden trough, into which juniper twigs are placed, is traditionally used for sieving the wort after mashing. Despite the looks of a 5W-50 lubricant (often, right down to the plastic container), sahti goes down remarkably well as the little carbonation that is present in the drink is all produced naturally as a by-product of fermentation by the feisty baker’s yeast – another trait resembling real ale. The beer probably dates back thousands of years and has traditionally been an essential ingredient in weddings and funerals and after harvests. The craft of sahti preparation is most stout in the regions of Kanta-Häme, Päijät-Häme and Pohjois-Satakunta where the tradition keeps on fermenting through the enthusiasm of local associations, a few commercial microbreweries, and of course, home brewers. What is not so great about sahti? It can be hard to find. So far, perhaps the most reliable source to my knowledge is the Tuulonen shopping centre, where Lammin Sahti can be purchased. Luckily, you can always make it yourself. This simple “Kitchen sahti” recipe is an adaptation from a Finnish book on the subject called Sahti – Elävä muinaisolut. For 5–6 l of sahti, you will need approximately 3 kg sahti malt, which is basically pilsner malt mixed with a hint of darker malt. You can replace approximately 5–10% of the total grain bill with malted rye, or as I did, with 100 g of malt extract which largely consists of rye. Juniper twigs and berries can also be used. Heat up 6.6 l of strike water in a large kettle, add the grains, up to 1 dl of juniper berries and a small juniper twig. Step mash with 45-minute rests at 60, 70 and 80° C respectively. If you want to be more traditional, you can take even more time, starting at lower temperatures and adding the water gradually into the mash. Once done mashing, recirculate half of the wort through your sieving system, preferably through a couple of added juniper twigs to separate the wort and the grit. 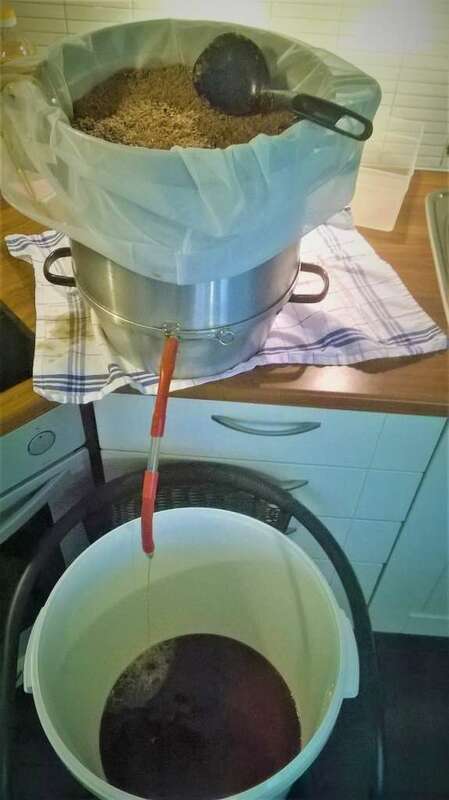 Boil 3–4 litres of water for sparging. 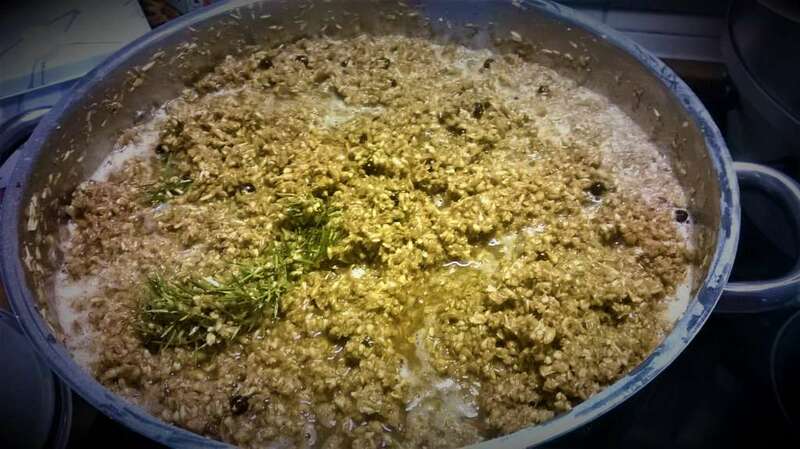 Alternatively, steep juniper twigs and use that water for sparging. Sparge, and lauter the wort into the fermentation vessel to collect approximately 6 litres of wort. Cool the wort to approximately 20° C and aerate it by collecting and pouring back multiple scoops of wort into the fermenter using a sanitised scoop. Mix 6 g of baker’s yeast with 1 dl of cool sterilised water in a sanitised glass. Pitch this creamy blend into the wort and shake the vessel. Ferment at 18–23° C for approximately two days. At the end of the primary fermentation, transfer into a secondary container or containers for cold-conditioning at 0–10° C for at least 10 days. After that, the flavour keeps on developing but you may start having pints to determine when your sahti is at its peak. It is advisable, however, to consume the batch within a month from its brewing day.